If you're having difficulty logging into this website, there are a couple likely problems. Ensure that your password is entered correctly. The initial passwords that were sent to you will be a short string of digits and letters. Some of these passwords may contain the number 0 (zero). They will never contain the letter O. For example: The following password contains 2 zeros. Never the letter O. If you are certain your username and password are being entered correctly, then it's likely that your Browser Privacy Settings are set too high to allow your browser to save your login status on your computer. Then select the Privacy tab in the Internet Options dialog box. It is very important that the Privacy level not be set any higher than Medium High. This will result in blocking your attempts to log in. Not seeing something you've posted to a forum until you either shut down all your browser windows and then re-browse to the forums. In Internet Explorer, verify that your browser isn't caching pages using the Tools->Internet Options dialog as above, but use the Settings... button on the General tab as shown below. If you have problems logging in, or if you are experiencing problems with the system kicking you to the login page for no reason, you must make sure your browser has cookies properly enabled. In some recent browsers, just having cookies turned "on" is not enough, so please be sure to read the instructions that fits your needs. You may also want to try clearing your browser's cache. Refer to the instructions below for help. You can successfully log in, but you still see the Login Name and Password boxes in the menu, or you are repeatedly taken back to the login page. You are typing in your Login Name and Password and it is just bringing you back to the Login Name and Password field again. In the dropdown that appears, select "Preferences". Find "Internet" in the listings. "Enable Cookies" should be selected. Be sure the box that says "ACCEPT ALL COOKIES" is selected. Click the ADVANCED tab and scroll down until you see the word COOKIES. Click on ALWAYS ACCEPT COOKIES. Click on APPLY and then OK to exit. Click on MEMBERS or MY AOL. Click on WWW or WEB. Click on ADVANCED TAB and scroll down until you see the word COOKIES. Cookies are NOT available through v3.x for Mac. AOL recommends upgrading to latest version. Click on the + (plus sign) next to Advanced. Click on CACHE under word Advanced. Click on CLEAR MEMORY CACHE and CLEAR DISK CACHE. When it prompts 'is this okay,' click OK. Click OK to exit out of the prompt. Click on DELETE FILES under the Temporary Internet File Category (in the General tab). Click OK.
Click on Ã¢â‚¬ËœMY AOLÃ¢â‚¬â„¢ (on the tool bar at the top of the AOL Screen). In order to make this website easier to access and more friendly, here are a few tips. The passwords generated by this website if you forget yours, or just created a new account are not what I'd really consider friendly and easy to remember, you should visit the Account Information and enter a new password. Enter it carefully because it matters whether you use upper or lower case letters. Pick something you can remember but others can't easily guess. Also feel free to fill in any information you want people to know about you ie: boat name, etc. in the "Bio" section.". If you have a small picture you'd like to attach of yourself, family, etc.., you can do this in the "Account Information" section as well. The website will take care of resizing and compressing it for the web. This will be show up in your profile and also as a small Camera Icon next to your name in the who's online block. Feel free to change it from time to time by simply attaching a new photo. The old one automatically replaced by the new photo. If you don't like to have to login each time you visit from your personal computer, you can also change the Remember Me setting to something like 1 Month in the Account Information area and you'll be automatically logged in from this computer for up to one month, until you Log Out of the website, or delete stored browser cookies from your computer. PLEASE keep your email address current in Account Information at all times. This is where the website will send information to you in the event you lose your password. This email address is not exposed directly to any members on this website. Please report any instances where you see your email address listed explicitly and we'll see that it gets hidden or removed. Posted for Allan Field. News Flash!!! C320IA logo'd merchandise is now available through Lands' End. Official C320IA burgees make a great gift! 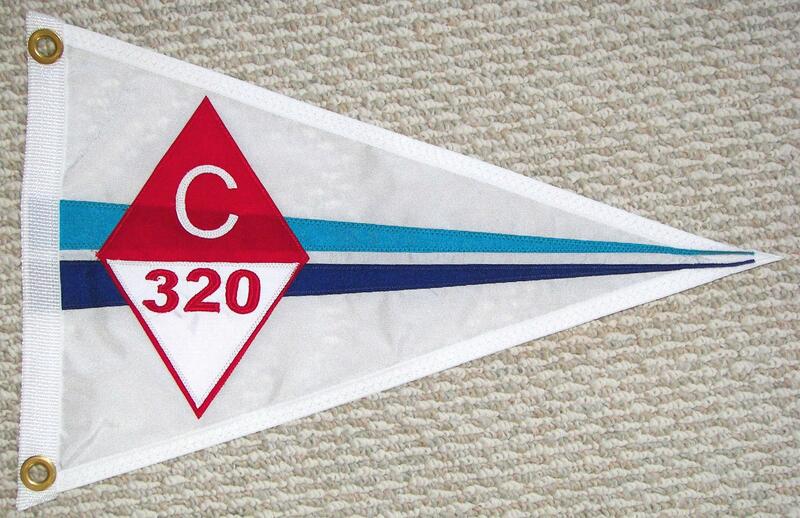 These are 12" x 18" Pennant style with our logo correctly reading on both sides. The blue and teal colors replicate the accent stripes found on the early boats. This burgee has been available directly from Prestige Flags for many years but few members have taken the opportunity to purchase one. We hope that by stocking them in our “Ship's Store", more members will be encouraged to purchase and fly them! 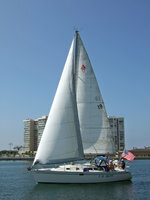 Catalina 320 International Association members in good standing may order directly from the association for $28 (includes shipping costs). Price is also just $28.